This is just what the doctor ordered. With cold and flu season upon us, a bowl of soup packed with immune-boosting ingredients is a great source of healing for your family. Your family will love to sit down to the fall chill with a bowl of warm, nourishing, immune boosting, veggie and protein packed soup. Lentils are called a nutritional “fountain of youth.” They are loaded with fiber, folate, iron, protein, and other vitamins and minerals. 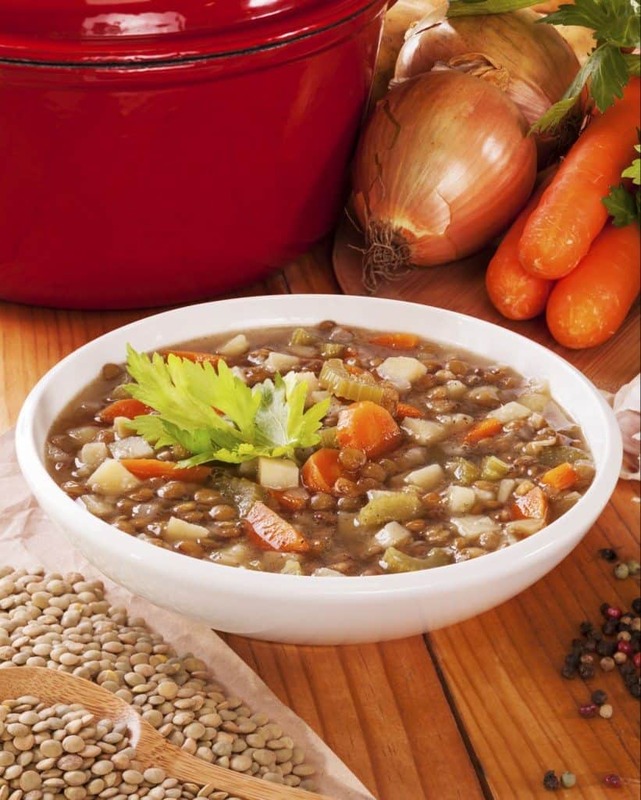 Researchers who studied older adults found that eating lentils is an important dietary factor for longevity. In this recipe, we are adding tomatoes and spinach to enhance the flavor and nutritional value of the soup. Tomatoes contain lycopene, which reduces your risk of heart disease and cancer. Spinach is loaded with folate and B-vitamins and has been said to lower blood pressure and improve bone health. This recipe also has carrots, which is full of vitamin A, vitamin K, and fiber. This veggie can help your eyes stay healthy. Celery gets a bad rap, because of its water content and light flavor, but it also has many nutrients including vitamin K, folate, and potassium. It also makes a great addition to this soup. In all, this yummy soup will warm you up and get you the nutrients you need during the upcoming cold winter nights! In a pan, heat oil and add onion, celery, and garlic, stirring until they are soft. Stir in all ingredients except the tomatoes. Bring to a boil the reduce heat and simmer 20 minutes or until all the vegetables are tender. Stir in the tomatoes. Simmer until the tomatoes are cooked into the soup.